Is psychoanalysis knowledge? Is psychoanalysis a science, or is it hermeneutics? Can clinical material be considered research data? Psychoanalysis is ambiguous about whether it is about meaning or about truth, and the relations between these two compelling experiences. Psychoanalysts often think of their work as closer to the humanities than to medical and natural science. The wider the gap between science and psychoanalysis appears, the more psychoanalysts feel pulled to something that respects subjectivity, the humanity of their patients themselves, and move away from the procedures of natural science. Research on the Couch is a relevant and timely contribution to the current debate about both the nature and validity of psychoanalysis and its body of knowledge. Freud always regarded his clinical material as his research data. In this book R.D. Hinshelwood aims to explore that view and defend Freud's claim whilst acknowledging the criticisms of single case studies and the inevitable problems for research into human subjectivity and personal experience. To this end the book reviews Freud’s own methods of disseminating his discoveries, discusses the problem of evaluating different claims to psychoanalytic knowledge, and presents a cogent logical model for testing psychoanalytic theories clinically. This book evolves a model for the generation and justification of psychoanalytic knowledge, a 'parascience' just as rigorous as natural science, and one that addresses the subjectivity of meaning. 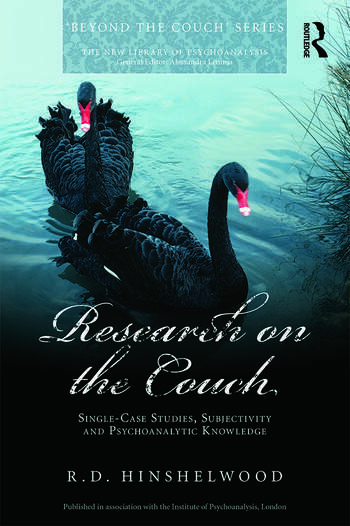 Research on the Couch will be of interest to psychoanalysts of all schools, academics, clinicians, students and those keen to further their knowledge of psychoanalytic studies. Preface. Part I: Introduction. Holding the centre. Research off the couch. Possibilities. Part II: Basics: What is belief, what is science? Feeling convinced. Reality and objectivity: Concerning the 'psychoanalysis-as-science' debate. What is knowledge? The scientific model of knowledge-production. Single case studies: Their validity. Freud's claims. What about hermeneutics? Is there a post-modern approach? Inference and occurrences. So far, so good; concluding Part II. Part III: Justifying psychoanalytic knowledge. Certainty and single cases: Research designs for psychoanalysis. Selecting facts; circular arguments. Causal theories and hermeneutic theories. Theories and meaning occurrences. Change sequence as evidence. Prediction: Results and false positives. Causes and meanings: again. Part IV – Testing the test. What you can do with clinical material. A moment of repression. Sexual hyperactivity disorder. Clinical archaeology – The Ratman. Comparative research. The two analyses of Dr Kohut. Weiss' Miss P. The Angry Lad. In conclusion.References. R.D. Hinshelwood is Professor in the Centre for Psychoanalytic Studies, University of Essex. He is a Fellow of the British Psychoanalytical Society, and a Fellow of the Royal College of Psychiatrists. He has authored numerous books and articles on Kleinian psychoanalysis. Observing Organisations (2000) was edited with Wilhelm Skogstad and is among a number of texts he has written on psychoanalytic methodologies.